I'm here at Denver for the start of the April Meeting of the American Physical Society (APS) and the theme of the meeting is "Quarks to Cosmos" and can offer this brief summary of events. So, just waiting for the first morning session to begin. 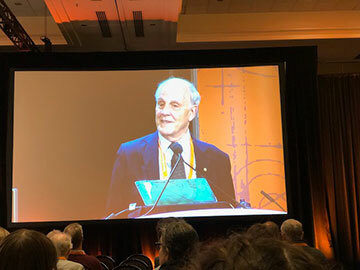 David Gross, APS 2019 President, and sharer in the Nobel Prize for the development and discovery of asymptotic freedom in particle physics, welcomes us to Denver and starts off the morning lecture series. 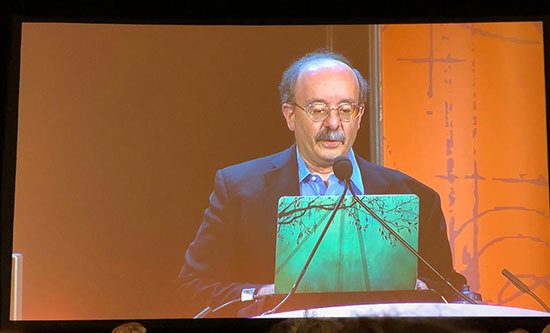 The leadoff speaker Amory Lovins from the Rocky Mountain Institute (RMI). He spoke on the important role in physics in developing new energy sources and how design ideas, of just designing buildings and manufacturing processes in smarter ways, rather than necessarily needing new technology, can achieve better use of and cost savings in energy. 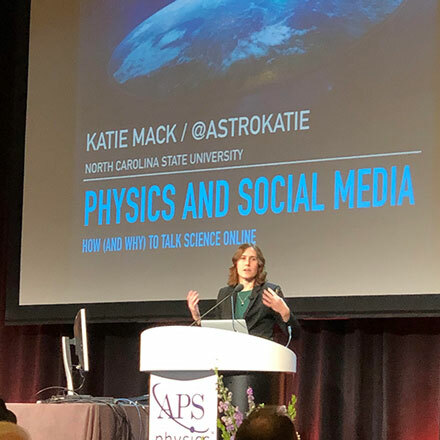 Another plenary session speaker was Dr. Katie Mack, NCSU, also known to many of us for her Twitter feed as AstroKatie. She spoke on the how and why physicists should choose to engage with the public and social media. She presented several slides of data showing how much of the public (80%) has little understanding of science and often think of scientists as the evil scientist caricature and that physicists should not just explain and say what the facts are, but to try to understand better how to engage with public. I have been following AstroKatie for a number of years now, ever since she spoke at the CSULB Physics Colloquium. This was at a time when CSULB was hiring some new professors and she visited the campus as part of that process. I enjoyed her presentation. I voted to hire her. What? Wait a minute, I have no role in hiring anybody and I was not asked nor did my opinion matter! I'm just a senior student! Anyway, I would have hired her! 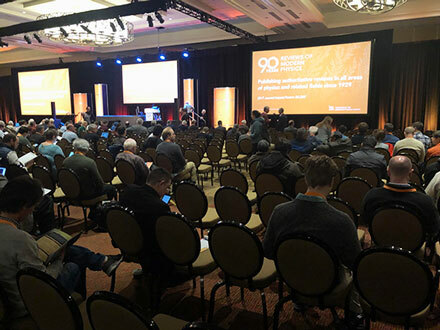 After this morning plenary session, it was time to breakout and attend the many, couple of dozen, breakout sessions that were focused more tightly on a specific area of physics. This is the time that is difficult for me in that there are so many topics to choose from and one has to be careful because some of the sessions are very technical and if you are not an expert in that area then it is easy to get lost and overwhelmed. On of my first sessions was a mini symposium on cosmic rays. Now I am interested in this topic, but just by chance I visited with the symposium invited speaker, Dr. Stephane Coutu, Penn State, while we were in line at Starbucks. He saw where I was from and he said that he knew most of the observatories in California and did not know where Palmia Observatory was. Well, what was I to do, but in the interest of full disclosure, just said "in my backyard!" Anyway, I attended his lecture and show one of his slides below. As you can see, cosmic rays are not just high energy protons from far reaches of the universe, but often consist of various atomic nuclei. Most of the cosmic rays are hydrogen and helium nuclei, but the other elements also show up in relative abundances. So the issue with cosmic rays has always been how they are generated and where they are generated. Because they have such high energies and are often charged, their trajectory from generation to detection here on Earth is along some unknown path due to the galactic magnetic fields. It is not clear if they are generated in our Milky Way galaxy or come from other remote galaxies. 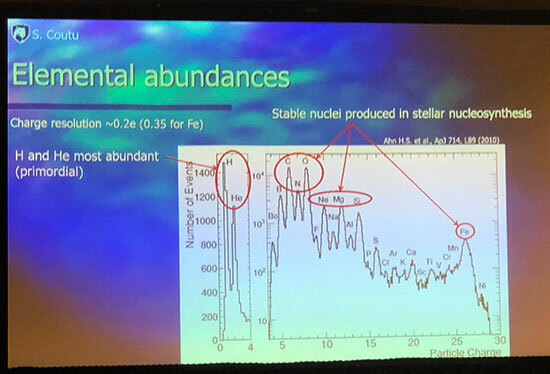 But the thing I learned in this lecture was that scientists have determined that the ration between the amount of boron and carbon nuclei gives some clue as to how long ago and how far away the particle had been accelerated. So that is really neat to see that there are clues imbedded in the abundances themselves as to when the cosmic rays were formed and then in some sense we can see the maximum distance they could have travelled. Thanks for illuminating that concept, Professor Coutu! Then, just to get a better idea about how NASA sets goals and determines which missions to fund and launch, I sat in on a session covering the Decadal Survey. This survey identifies the key unknowns and areas where science can make the most significant discoveries and which space probe will eventually be funded. At one time, the Hubble Space Telescope was on this list of projects. Rita Sambruna, NASA HQ, talked about what the survey is and the process that goes into making it. 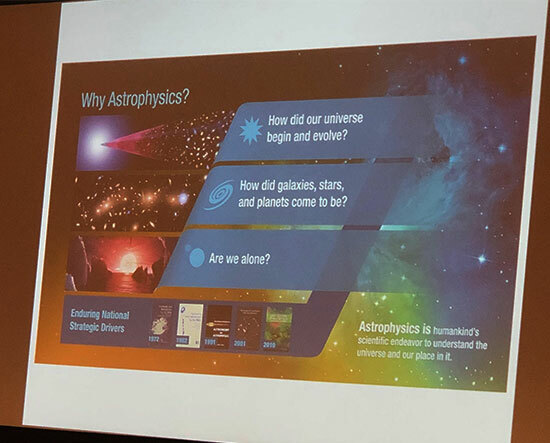 The three main questions and goals for astrophysics are outlined in the slide below. 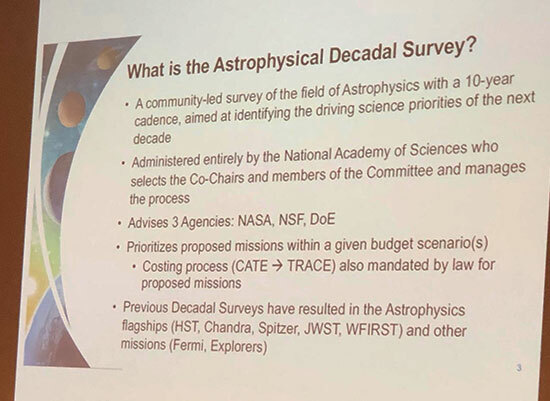 Dr. Sambuna had one summary slide of what the Astrophysical Decadal Survey is and I can't explain it any better than is outline in this slide. Finally at the end of the first day, APS often schedules a public lecture where other folks in the Denver community could attend for free. 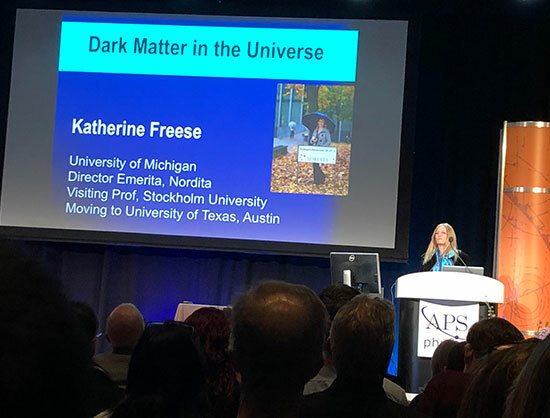 This time, Katherine Freese, U. of Michigan, gave the public lecture, "Dark Matter in the Universe." I have been following Katherine's astrophysics work for a number of years now, ever since I attended a book signing lecture for her book "The Cosmic Cocktail." She showed up wearing a feather boa and I knew right away that she was going to be a fun author and presenter. I wanted her to sign the book, but I had my copy electronically on my Ipad, so that was not going to happen. The boa had been sort of her signature accessory and just by chance at this meeting in Denver I bumped into her and we talked about some physics paper or whatnot and eventually I had to ask if she was going to wear the boa at the lecture. She laughed and said, no, not for this crowd. You might want to check out her book if you have not already done so, or follow her on Twitter, but the pertinent thing for the dark matter lecture was the "Recipe for the Cosmos." 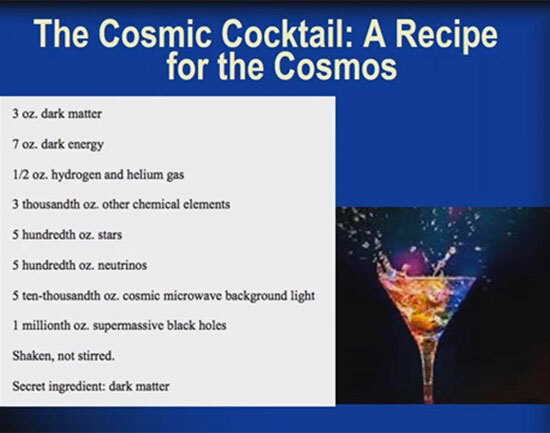 We recognize right away the 70% or so dark energy part and the 25% or so dark matter part, but look at the other miniscule parts that go into the recipe for the cosmos. 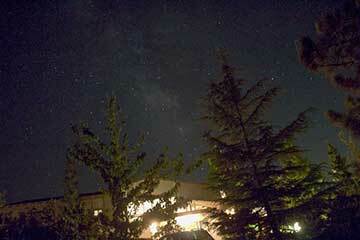 Most of the normal matter, 1/2 ounce is in hydrogen and helium gas with just 5/100 of an ounce in the form of stars. Black holes, as menacing as they appear in popular accounts only make up 1 millionth of an ounce! I was happy to see that her recipe, just like for any good martini, should be shaken, not stirred! 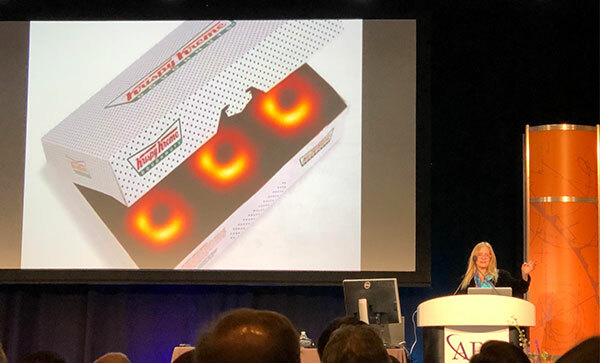 Katherine could not help but to continue on this theme of black holes not being the dark matter and joked about the latest photo image by the EHT collaboration of the black hole in M87. There is a Krispy Kreme shop just across the street from the meeting hotel, but I missed seeing this donut version! 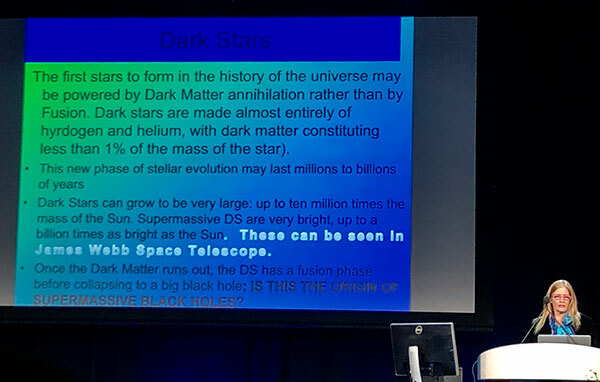 She ended the lecture with some mention of the possibility of dark stars, that is stars made up of some portion of dark matter. Now stars today probably contain some dark matter, but the idea of dark stars forming just a short period after the big bang is the main place where dark stars might play a key part in the structure formation of the universe. The slide below shows many of the key points. If some of the first stars were made out of dark matter, then dark matter annihilation could be going on and this could have prevented the collapse of the young star, but the star could have continued to accrete hydrogen gas gravitationally and could have become very massive. Then when the force of gravity finally overcame the annihilation energy, the star could have just collapsed directly to a black hole, maybe even the start of a supermassive black hole. This is a pretty neat idea and might explain how supermassive black holes form. We just need to wait for the evidence, if it is there!